Well hello Minnesota! Now you can shop till ya drop AND enjoy Kosher food. With a relatively new plant-based fast food chain under the CRC, you don’t need to feel guilty about what you eat after spending all that money. 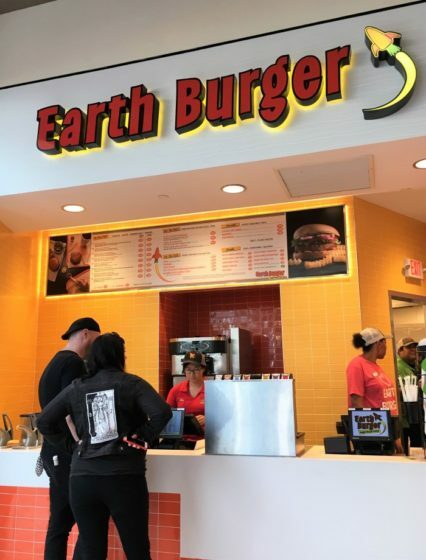 Earth Burger is a Kosher Vegan stand inside the second biggest mall in the United States. Mall of America is located right outside of Minneapolis, MN. Nothing is “impossible” anymore now that they have the new Impossible Burger as a staple item on their menu. Other menu items (which can be made Gluten Free) are BBQ Pulled Jackfruit sandwich, Fishless sandwich and the Spicy Chik-N sandwich. Of course you can get Fries with all that, but they will be serving other side dishes as well. Hummus & carrot sticks, Kale salad and edamame will be options. And what’s a feast like this without dessert and drink options. Shakes, soft serve, brownies and sodas will be available too.